More flooding in Hebden Bridge? On Saturday 11th June we spread some wood chip around the fruit trees and fruit bushes in the community orchard. 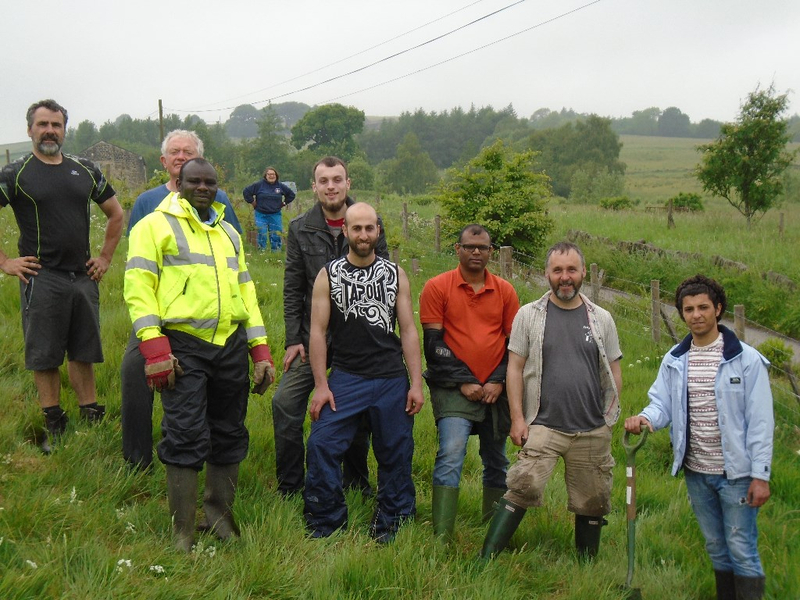 Some asylum seekers from the Together We Grow project (www.togetherwegrow2.org.uk) helped local residents. 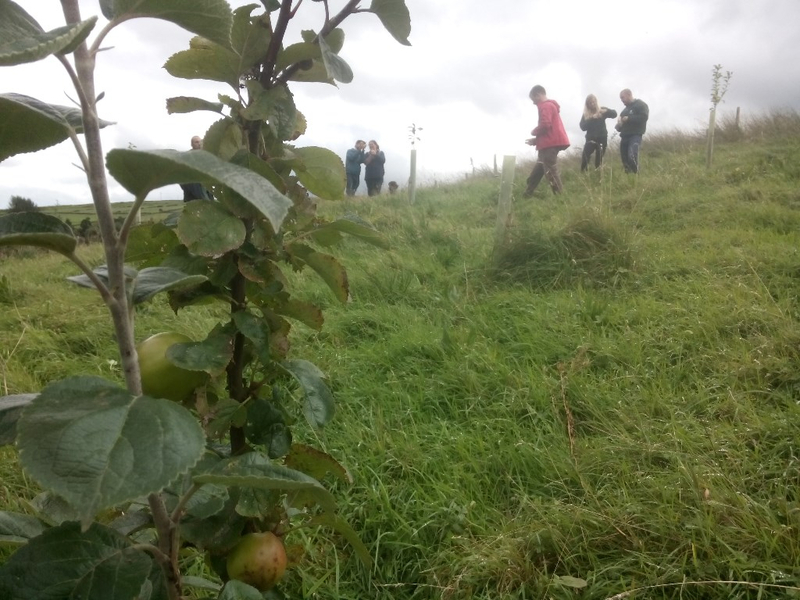 A few other seasonal jobs were also done at the community orchard: removing grass from around the fruit bushes and wind break and pruning the plum trees. Many thanks to Jonathan and Sally for donating bags of wood chip to the community orchard – to be used as mulching next year around the fruit trees and fruit bushes. Pleased to report that BEAT's orchard has now got its first apples. The ones on the picture are Cockpit apples. There should be more apples, plums and soft fruit in the years to come - for local residents to pick for their own use. Any surplus can go to a local food bank. 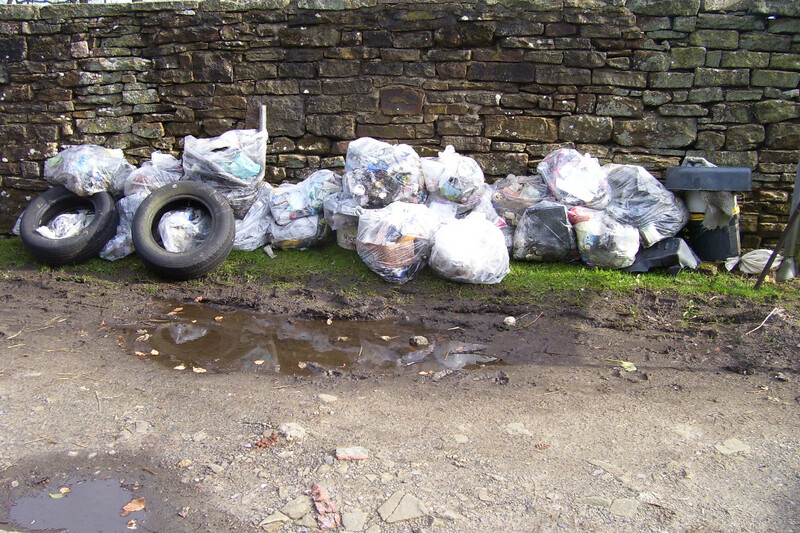 The next village clean-up in Blackshaw Head is on Saturday 8th October at 10.30AM. We will meet at the Chapel and be given gloves, pickers, plastic bags for the rubbish and a route to take. After about an hour's work we will meet at the Chapel for coffee, tea and cakes. Hope you can make it. 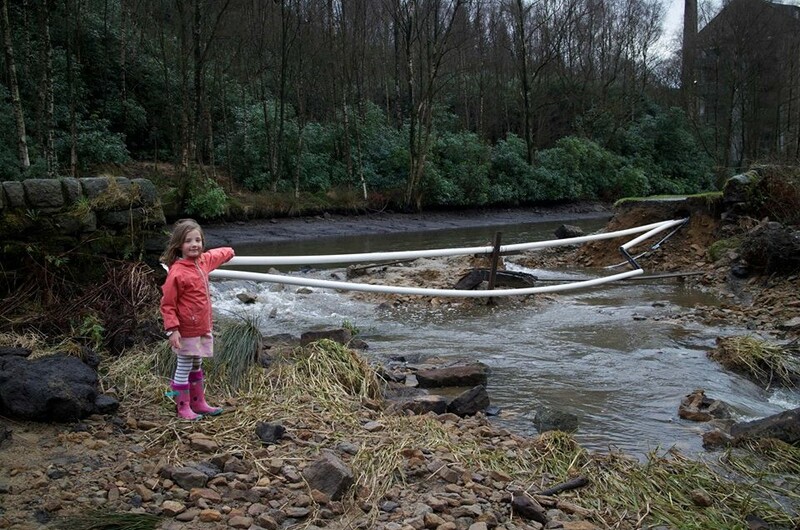 238 homes, 48 businesses and a school in the Calder Valley are still uninhabitable after the Boxing Day floods. New research has been published as part of the National Flood Resilience review which shows that things could get much worse in the future. The review asked the Met Office to develop new extreme rainfall scenarios. With 20% more rain falling the Met Office said that a further 400 homes in Hebden Bridge and a similar number in Mytholmroyd, on top of those flooded last winter would be inundated in these extreme rainfall scenarios. Due to climate change these extreme events are likely to become more frequent. Colden Junior & Infant School’s pupils have started the new school term with solar panels providing clean, green, renewable electricity to power their learning. A Green Fair will be held on Friday 14th October from 4pm to celebrate the PV panels. There will be stalls, bouncy castle, etc and it is open to the public. So invite family and friends. The panels have been provided to the school by local community energy organisation Pennine Community Power (PCP), with grant funding of £16,000 provided by the players of the Postcode Lottery Trust. 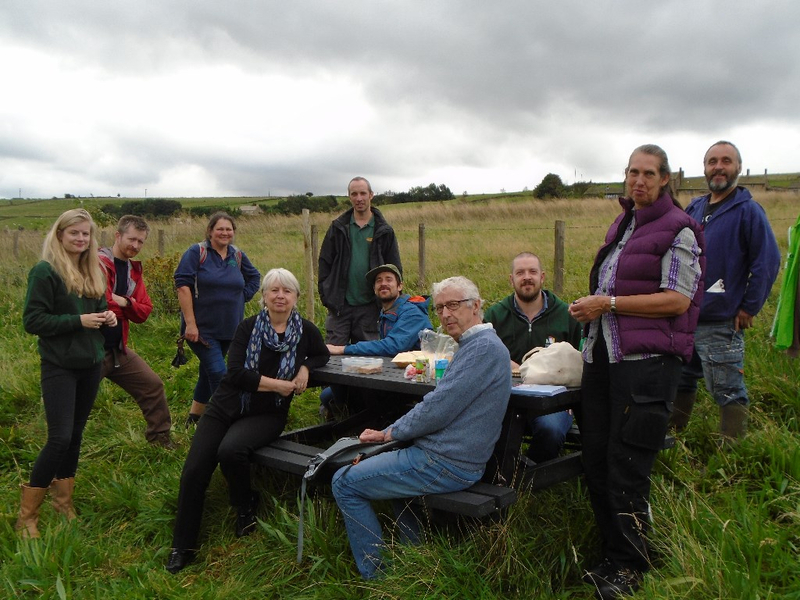 Additional grant funding was provided by the Community Foundation for Calderdale, Friends of Colden School and Blackshaw Environmental Action Team (BEAT). 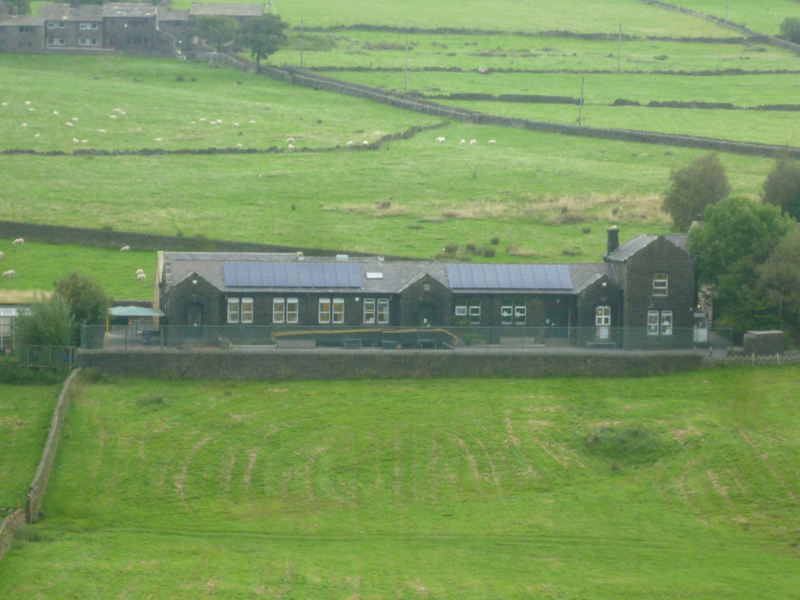 Head Teacher, Ms Peberdy said, "Our new solar PV system is a fantastic addition to the school, both as a teaching resource for our pupils to learn about energy and how it is generated and used, and also to provide a valuable on-site asset to help release funds that would otherwise be spent on our electricity bill. PCP also provided teaching resources to help us communicate the sometimes complex issues of energy, climate change and resource use to our pupils in an exciting and engaging way." On a warm, sunny September afternoon the Great Rock Coop, GRC, had its Annual General Meeting. 19 people attended a very successful meeting and many more were able to talk about GRC before the formal business meeting. As usual when holding their events, GRC had free children’s activities available, this time making corn dollies and lavender bags. The treasurer, Keith, gave a report on the state of the Coop. The £23,000 total local spending in the last financial year was similar to the previous year. The producers keep 80% of the sales price and GRC keeps the 20% for the running costs of the shop. So unlike supermarkets most of the money stays in the local economy. 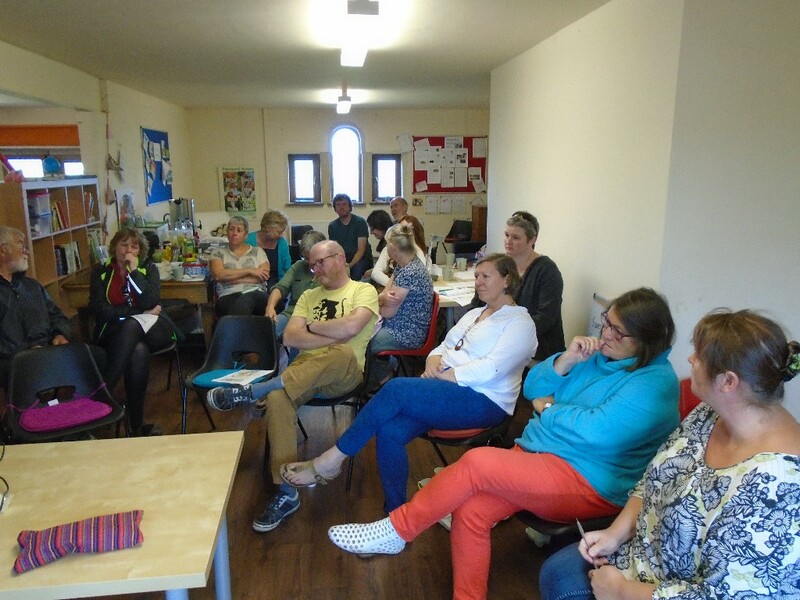 The funds to the Coop enabled it to buy a new freezer, buy in lots of stock like coffee, rice, curry sauce and cider from other coops locally and around the world and pay all the ongoing costs such as insurance and so on. The good news was that the Coop breaks even but it does not have savings/profit to deal with the unexpected and needs to build its reserves. The produce it buys in from around the world includes rice and dhal from Malawi, and every 90kg of rice sold enables a Malawian farmer to pay for a year’s basics secondary education for one child. The ‘climate change’ coffee is sourced from coop farms engaged in sustainability projects. The farmers get better than standard Fair Trade prices. 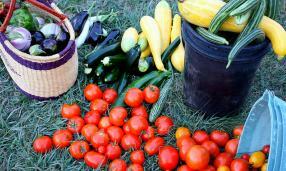 The Coop has a small army of local producers who supply GRC with meat, bread, eggs, vegetables, cheese, and so on. Three new members were elected to GRC’s board, which meets once a month. You can become a member of the coop for a one-off payment of £1 and producers pay £5 that includes a £4 contribution to the costs. 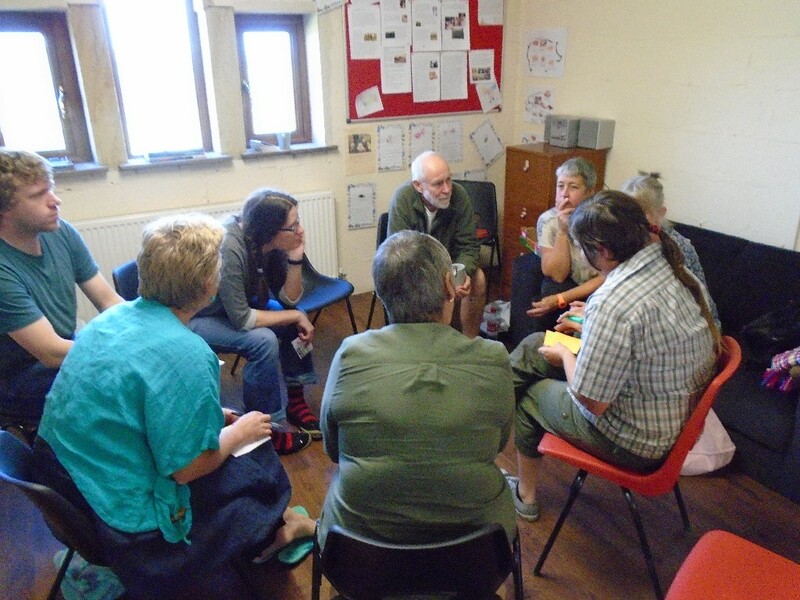 After the formal AGM business there was an interesting group discussion on how GRC could respond to the growing number of Food Assemblies – see https://foodassembly.com/en. Lots of ideas were thrown into the pot, to help think about what direction GRC should take: whether to become a Food Assembly or just continue the shop as it is, or some combination of the two. It was felt that GRC should consider setting up its own online scheme where producers each week could say what they have available for GRC and local residents could then order it to be ready for collection in the shop. This way a producer will have know better how much to bring to the shop, like how many cakes to make, and the customer would know that it will be available when they come to pick it up. The shop is currently open each Saturday from 10 – 2. It was suggested that maybe it could extend to being open on an evening each week as well. A working group was set up to take all the ideas forward. In December GRC will once again be having a range of stalls, children’s activities, and a café in the room upstairs. 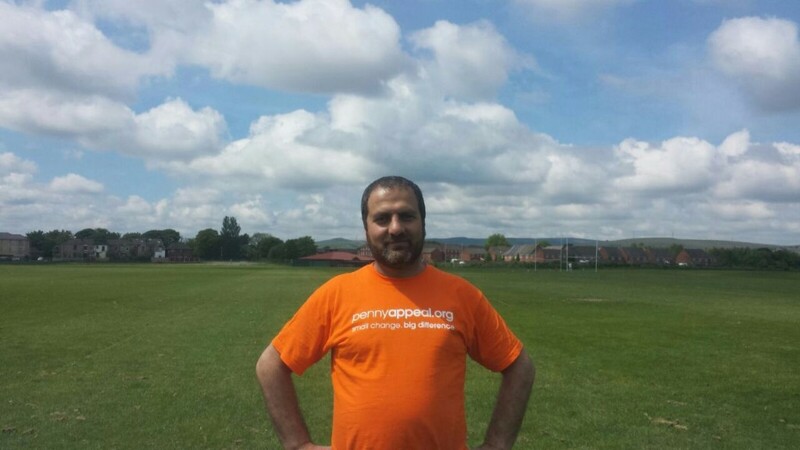 ⦁ A famous Syrian singer, Moheddin Aljabi, sings in Arabic, French and English and is a refugee living in the South of England. His daughter, Enas Aljabi, will also be singing. 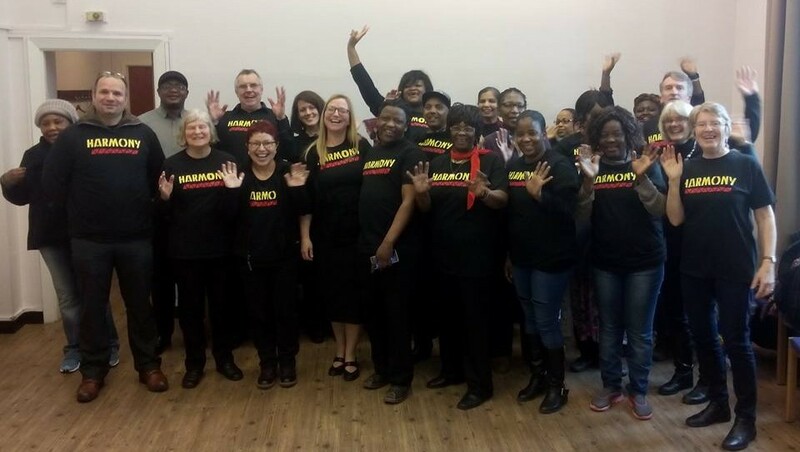 ⦁ The Harmony choir from Leeds is made up of asylum seekers, refugees and local residents. ⦁ Songo, a drumming group from Sheffield with a mix of asylum seekers, refugees and local residents. 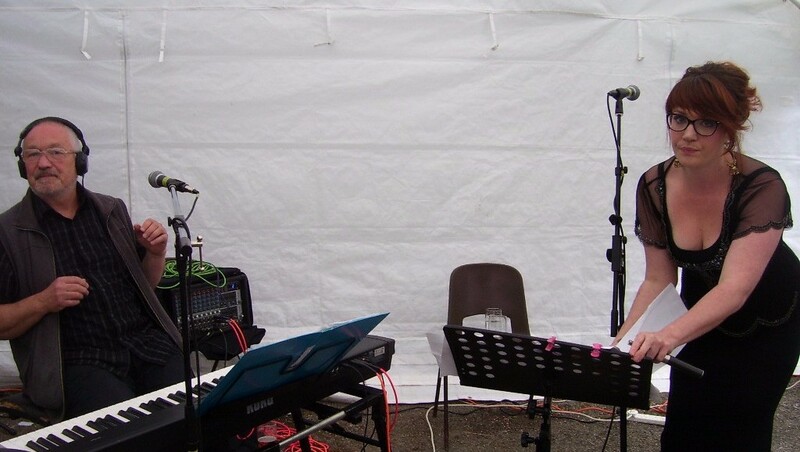 ⦁ Dave Nelson on keyboard and Charlie Carr singing. For the children there will also be face painting and arts & crafts activities. There will be stalls with information about refugee issues. Tea, coffee, juices and cakes will be sold. Feel free to bring a cake for the refreshment table. Car parking spaces is limited at the Birchcliffe Centre. We ask for only cars with disabled passengers to use them. These events are jointly organised by Calderdale Freedom From Torture, https://www.freedomfromtorture.org/get-involved/volunteering/local-groups/calderdale, and Together We Grow, http://togetherwegrow.org.uk/. We are very grateful to Community Foundation For Calderdale for their grant towards this event. 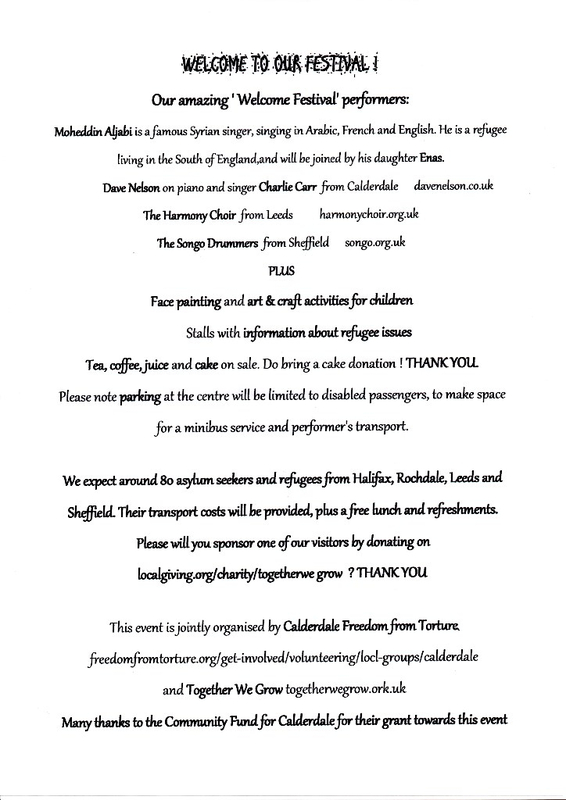 The organisers expect between 70-80 asylum seekers and refugees from Halifax, Rochdale, Sheffield and Leeds to attend the event. We will pay for them all to use public transport to come to this event and provide them with a free lunch. If you would like to sponsor one of them to be able to come you can give a donation via https://localgiving.org/charity/togetherwegrow/. Chris Goodall is an expert in energy transition – how to change our energy systems to become more sustainable, secure and affordable. In his recent book, The Switch, he has an optimistic story to tell which is very convincing. Goodall’s starting point is how photovoltaic (PV) solar panels keep getting cheaper and cheaper to the extent that they are already – without subsidies – cheaper than coal, oil and gas powered electricity in the sunnier parts of the world. By the mid 1970s the cost of a watt generated by PV was $100. Now it is about 50 cents and the decline continues. “Every time the world’s accumulated total of solar panels has doubled, the cost has reliably declined by about twenty per cent.” The famous learning curve. It is not just the cost of producing PV solar panels that keeps coming down. The cost of financing the instalment of large solar farms also goes down and down as the generated income is so predictable. At the same time the cost of energy storage keeps coming down – both for domestic use and for large industrial plants. Such energy storage makes it possible to create localised grids that do not need access to a national grid and might also be combined with other renewable energy (wind, hydro, biomass, etc). This is particular good news for the six billion people who live in the sunniest parts of the world, where 1.3 billion of them currently do not have any electricity and another billion only have an intermittent supply. Just like with mobile phones these people do not have to wait to a costly national grid network has been created. Or as reported in The Guardian in August 2016: An unpublished report by the energy department shows that it expects onshore wind power and large-scale solar to cost around £50-75 per megawatt hour of power generated in 2025. New nuclear is anticipated to be around £85-125/MWh, in line with the guaranteed price of £92.50/MWh that the government has offered Hinkley’s developer, EDF. However, what about the billion and a half people (20% of world population), which includes the UK population, who do not live in sunniest parts of the world? Can they rely on PV solar panels and other renewable energy technologies if combined with batteries, energy efficiency and inter-connectors between nations to exchange surplus? No, says Goddall and uses Germany as an example. We will need a way to store surplus electricity more long term for the winter months – particularly for periods when the wind is not blowing very much. One option is using a well-understood technology using surplus electricity in the summer months to create hydrogen through electrolysis. Hydrogen gas can be stored long term and then used to generate electricity when needed without emitting any greenhouse gases. However, it is possible to also use the hydrogen to create fuels by feeding the hydrogen along with CO2 to microbes that will exude energy-rich molecules. Unlike hydrogen these fuels can be kept in the existing oil and gas storage infrastructure. As hydrogen it can be used for transport. Solar electricity can of course also be used for transport (electrical cars, vans, trains, etc) and for heating via heat pumps. Fossil fuels will no longer be needed. DECC carries out regular surveys of public opinion on energy issues. Round 17 has just been completed. The first was in early 2012. The most recent poll shows increased support for the main renewables. 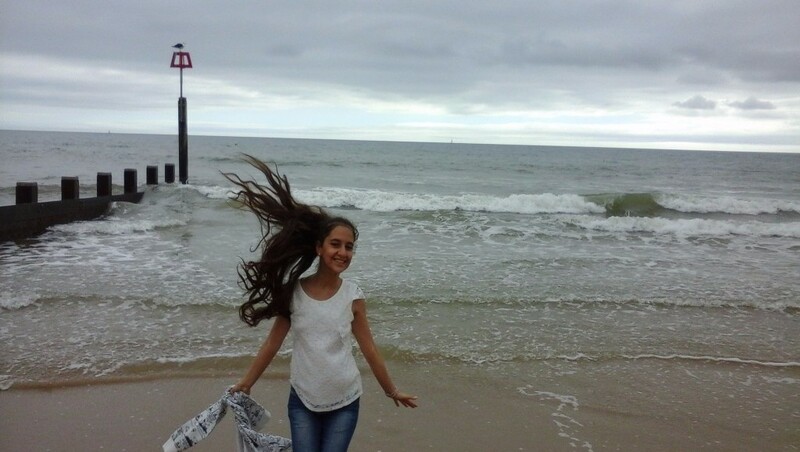 · Onshore wind reached a new high in support. The percentage of net approval (those in favour less those against) rose to 60%. The percentage thinking onshore wind is a good thing rose 3% from the previous survey while those opposing fell by 3%. The number against onshore wind was 9%, a new low. 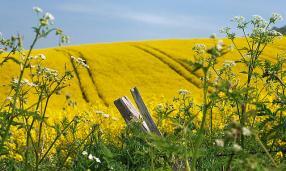 Only 3% of respondents ‘strongly oppose’ turbines on land. · Offshore wind also saw a new peak in approval. The net approval rate was 71% with only 5% opposed. The number ‘strongly opposed’ fell to a new low of 1%. · Solar PV has a net approval rating of 80% is close to the previous peak. Only 1% ‘strongly oppose’. Support for nuclear is stable. · Net approval numbers have moved around in recent surveys but 15% the current poll figures are unchanged from the last round. · 20% of respondents have a smart meter. The numbers using the energy use monitor are rising. Climate change worries people more. · Those saying they are ‘concerned’ total 70%, a new high. Those unconcerned fell to 29%, a new low. · Those seeing climate change as being caused by man’s activities increased in number. Those who see it as a result of natural processes fell to the lowest number ever. · Climate change is one of the top three of a list of political issues for 22% of people. Those putting it top account for 6% of the respondents.